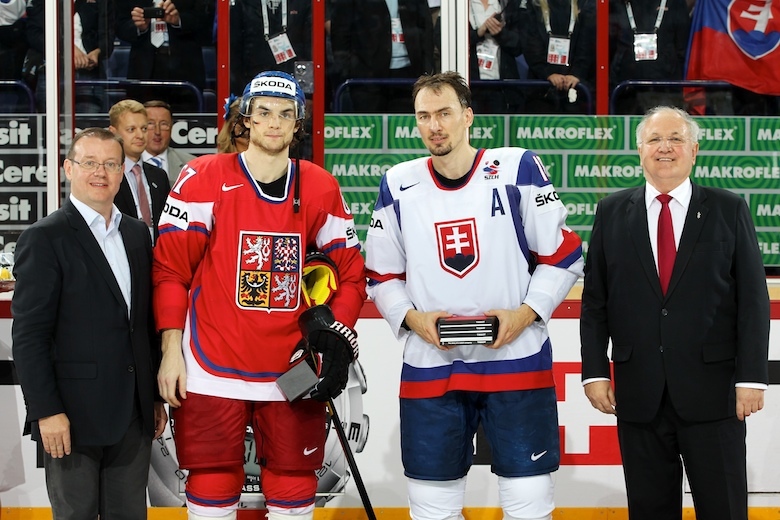 Czech Hockey Report: Prague & Bratislava to co-host Worlds? Prague & Bratislava to co-host Worlds? The 2012 IIHF World Championships, the first of two in a row to be co-hosted by Stockholm and Helsinki, have just finished. Throughout the tournament, the pros and cons of two countries sharing the event have been weighed, and that will probably continue for some time. Among future possibilities now being discussed is one involving the Czech Republic and Slovakia. natural choice to co-host. Photo: Andre Ringuette, IIHF-HHOF. As far as bi-national co-hosting situations go, none would seem more logical than a tournament held by the two states that used to be one country, specifically their respective capitals, Prague and Bratislava. After all, the two cities have co-hosted the event twice before, in 1959 and 1992, when they were both still part of Czechoslovakia. IIHF President René Fasel, for one, thinks it could work. "The Czechs and Slovaks speak almost the same language and are very close to each other," he told Michael Langr of of idnes.cz. "I think it's a good idea and a great opportunity." The World Championship is scheduled to return to the Czech Republic in 2015. Prague will be the primary host and Ostrava, the city that co-hosted with Prague in 2004, is penciled in to do so again. Other options, such as Brno, Plzeň and Pardubice have also been mentioned, and now Bratislava. The sharing would be reciprocated the next time Slovakia is granted to host the event. Some of the detractors of this type of situation point to the poor attendance this year in Stockholm, suggesting that interest would have been greater in a smaller Finnish city, such as Turku. Fasel disagrees. "If we'd played this year in Helsinki and Turku, we would probably have had fewer fans than in Stockholm," he said confidently. History indicates that Fasel is correct. The 30 games in Stockholm this year drew a total of 149,363 spectators for an average of 4979 per game. While that's below what was anticipated at the 13,850-seat Globe, it is still more than a secondary venue normally draws at the World Championships. To begin with, these secondary venues are generally much smaller than the primary, usually seating somewhere between 5 and 10,000. The arenas are smaller because the cities themselves are. Besides a smaller population, a country's second-largest city usually has a lower average income as well, meaning that that smaller number of fans has less money to spend on tickets. Ticket prices may have to be reduced even further as the home team does not play in their venue, making it more difficult to create fan interest. These cities are generally less cosmopolitan, so there would not be as many local fans of any of the participating teams, and as tourist destinations they are usually not as attractive or easy to get to as the capitals, meaning fewer fans visiting from other countries. In 2004, Ostrava did well as a co-host, helping the tournament draw a record 552,097 fans to 56 games, for an average of 9859. That record was expected to be broken this year in Helsinki and Stockholm, but wasn't, further fueling the argument that the tournament should stay in a single country. However, imagining Prague was to draw at the same level as it did in 2004, it is not hard to imagine that a group in Bratislava, which would include Team Slovakia, would draw more than Ostrava could. A criticism some have about Helsinki and Stockholm co-hosting is the distance between the cities. In particular, it takes two ferries to get from one to the other, and can take over 10 hours. However, Prague and Bratislava are separated by only 330 km of highway, which can be driven in a little over three hours, and there are numerous direct trains and buses per day. That is an easier connection than in many single-nation tournaments. Quebec City and Halifax, the Canadian cities that co-hosted the 2008 tournament, are 1000 km apart by road, and public transportation options in North America are notoriously bad. Russia's two host cities in 2016 are Moscow and St. Petersburg, are almost as distant, separated by over 700 km. Prague is actually slightly closer to Bratislava than to Ostrava; the two Czech cities are separated by 375 km of highway. The Czech Republic and Slovakia are not the only countries that wish to co-host the World Championships: a joint bid by France and Germany have been submitted for the 2017 event. One thing is for sure: at least one future tournament will be held in two nations. Next year's tournament will again be held in Stockholm and Helsinki, this time with the Swedish capital hosting the semifinals and finals. "(This year's) tournament had its pros and cons," said Fasel. "In the summer, we will think about what can be done to improve it." If things go better, and most expect it will, perhaps the idea of two countries co-hosting the World Championship will have fewer detractors, and the door to a Czech-Slovak reunion (for a couple of weeks, at least) will be open. Where will Hašek end up? The biggest Czech goal of all time?